A house in Toronto gets their ensuite enhanced. A faux wood finish was applied to the door to match the existing mahogany wood cabinetry. This 140 year old house is one of the few remaining of it's kind in Pickering. It's original wood exterior hadn't been repainted for many years so the sun and weather had caused it to blister and peel. We cleaned and restored all the damaged panels, repainted the walls, stained and varnished the front door, and resealed the windows bringing back it's youthful glory. We've forged long-lasting relationships with our clients by providing the best work possible. This home now features faux finish marble pillars, custom decorative panels, two toned painted striped walls, gold gilded chandelier medallions, distressed cabinetry, and much more. An exciting cutting edge look. This fine residence has been decorated several times over throughout the decades giving the latest makeover an exciting cutting edge look. It's been our privilege to accomplish this work through several designers over the years. Brookfield Residential condo foyer gets a new look. The Equinox condo makes a unique architectural statement with 37 floors of magnificent suite and penthouse designs, but it needed a way to express that same sophistication in the main lobby. We worked with internal staff and residence to ensure timely completion with minimal interruptions, and the results were quickly noticed by everyone. 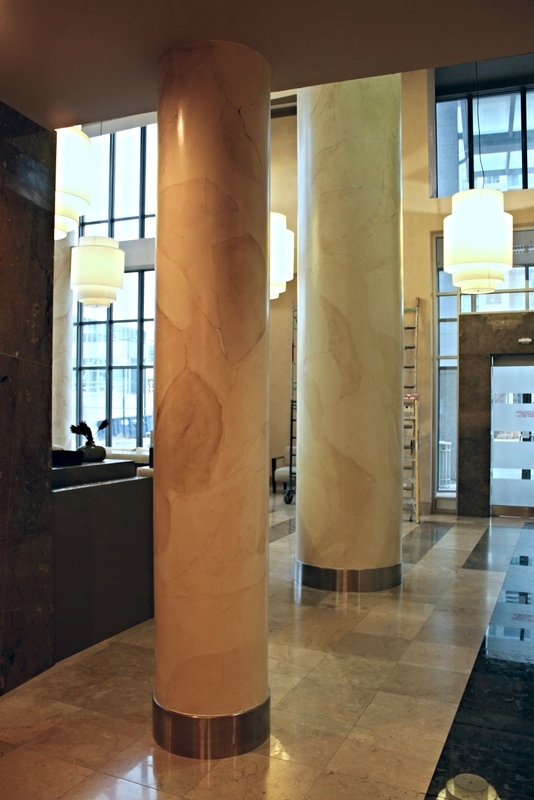 Equinox's lobby now features faux finished marble pillars from floor to ceiling, polished venetian plaster walls, including a darker feature wall, and a high gloss painted elevator hall. From hardware store to comfortable meeting place. We decorated a large auditorium and lounge from floor to ceiling with custom airbrushed panoramic murals. In the auditorium we place you on an island surrounded by city skylines representing the 6 continents of the world. And in the lounge we take a turn and place you in a cozy European town overlooking a lake for some R&R.